Abstract: Mapping the distribution of the quantity and value of forest benefits to local communities is useful for forest management, when socio-economic and conservation objectives may need to be traded off. 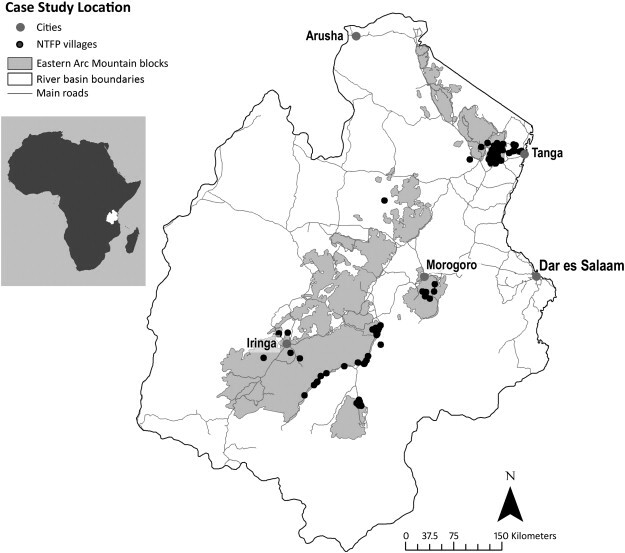 We develop a modelling approach for the economic valuation of annual Non-Timber Forest Product (NTFP) extraction at a large spatial scale, which has 4 main strengths: (1) it is based on household production functions using data of actual household behaviour, (2) it is spatially sensitive, using a range of explanatory variables related to socio-demographic characteristics, population density, resource availability and accessibility, (3) it captures the value of the actual flow rather than the potential stock, and (4) it is generic and can therefore be up-scaled across non-surveyed areas. 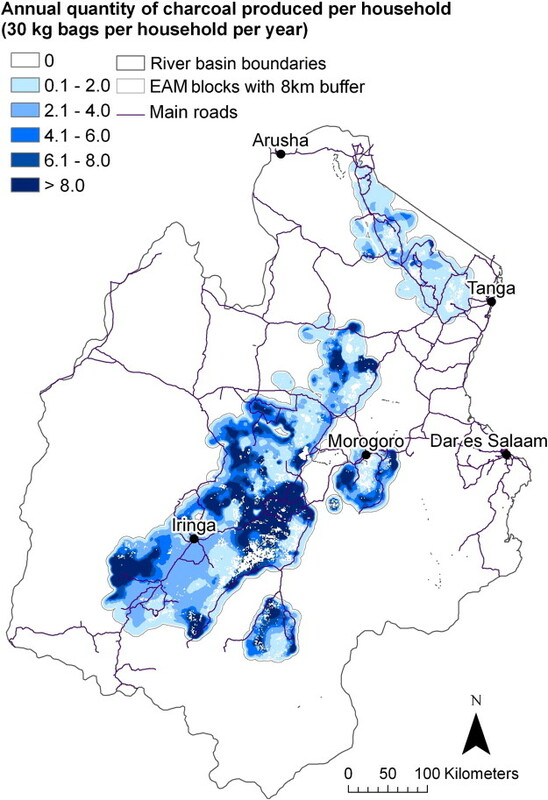 We illustrate the empirical application of this approach in an analysis of charcoal production in the Eastern Arc Mountains of Tanzania, using a dataset comprising over 1100 observations from 45 villages. The total flow of charcoal benefits is estimated at USD 14 million per year, providing an important source of income to local households, and supplying around 11% of the charcoal used in Dar es Salaam and other major cities. We discuss the potential and limitations of up-scaling micro-level analysis for NTFP valuation. ► We develop a spatially explicit modelling approach for NTFP production. ► This model is transferable in order to value NTFP production at a wide spatial scale. 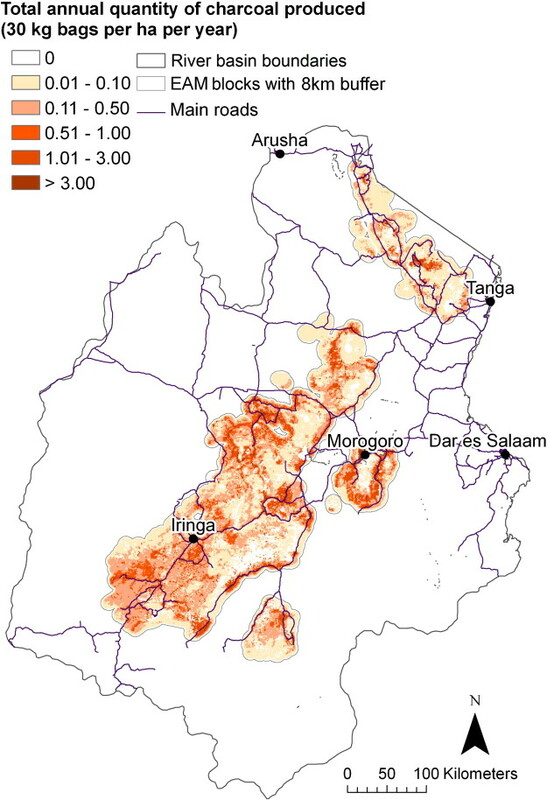 ► We analyse household charcoal production in the Eastern Arc Mountains of Tanzania. ► The annual benefits of charcoal production are estimated at USD 14 million per year. Fig. 1. Case study area.Notes: the NTFP villages are villages where the household level data on NTFP collection used in our analysis was collected. The delineation of the Eastern Arc Mountain blocks is based on Platts et al. (2011). The EAM blocks in Kenya were excluded from the analysis. The outer boundary reflects the river basin boundaries of rivers that originate in the EAM. Fig. 2. Annual quantity of charcoal produced per household (30 kg bags per household per year). Fig. 3. Total annual quantity of charcoal produced (30 kg bags per ha per year). Fig. 4. Total annual value of charcoal produced (TSH ∗ 1000 per ha per year).